My roots may be showing in this recipe. Kay’s Old-Fashioned Potato Salad With Cooked Dressing contains no raw onions or mustard. That’s the way we ate it back on the farm in Indiana. The cooked dressing is the secret to the yumminess going on here. No worries. It’s really easy if you make the dressing in the microwave, although you don’t have to if you prefer to do it on top of the stove. My roots may be showing in this recipe. It contains no raw onions or mustard. That’s the way we ate potato salad back on the farm in Indiana. 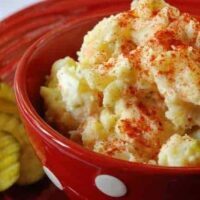 Potato salad is right up there with meatloaf, mashed potatoes, and chocolate cream pie. Everybody likes their mama’s best. But just in case you don’t have a favorite already, try this one. The same sister who makes good fried pies also makes a wonderful potato salad. Potato Salad with Cooked Dressing may be another recipe she got from her southern mother-in-law. I’m not sure. 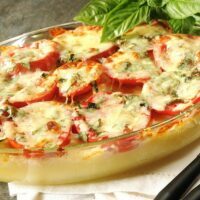 Kay’s recipe is unique in that the dressing is cooked. 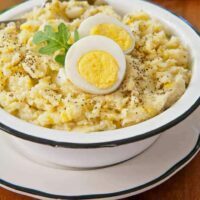 It has much more flavor than potato salad made with straight mayonnaise. Isn’t this more trouble? A little, but the flavor is worth it! 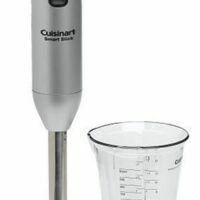 Pull out your blender, food processor, or a good whisk to mix up the ingredients for the dressing. Follow the easy directions for cooking the dressing in the microwave. 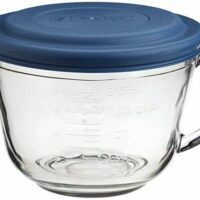 It’s foolproof–unlike the original recipe that called for cooking on top of the stove with constant stirring. It was easy to burn or curdle the old way. And Kay, you probably won’t be surprised that I cut the amount of butter in half. You won’t miss it. 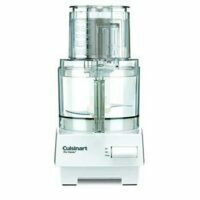 Blend first 6 ingredients in a blender, food processor or with a whisk until smooth. Add butter and onions. Pour into 2 quart batter bowl. Microwave on HIGH for 4-5 minutes, whisking well after every minute (important so sauce will be cook evenly). Mixture should be thick like pudding. 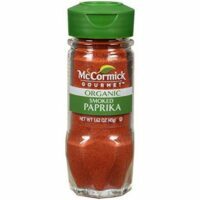 Do you have smoked paprika in your refrigerator? If not, use regular paprika. However, the smoked paprika adds a subtle bacon flavor that is delicious. Good on deviled eggs too. 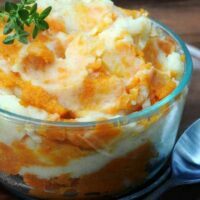 White potatoes and sweet potatoes are mashed, then swirled together make a great side dish. I made this potato salad a month ago and I loved it as did my guests. 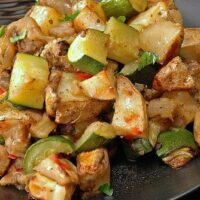 I did augment it with diced apple (a must for my potato salad) as well as a few other crunchy veggies (celery and red pepper), But it was the dressing that made it so delicious., I am making it again for a Labour Day gathering. I do have one question for you though. Would you put the dressing on hot or cold potatoes? I have seen recipes calling for both. It doesn’t really indicate in your recipe. Thanks for this one. It is a keeper. I happened to get your letter when I was sitting next to my sister, Kay at a ballgame. We talked it over and decided it doesn’t matter. We’ve both done it both ways. No big deal either way. Glad you like it as much as we do. And we love your additions. Like you said, with this recipe, it’s all about the dressing. 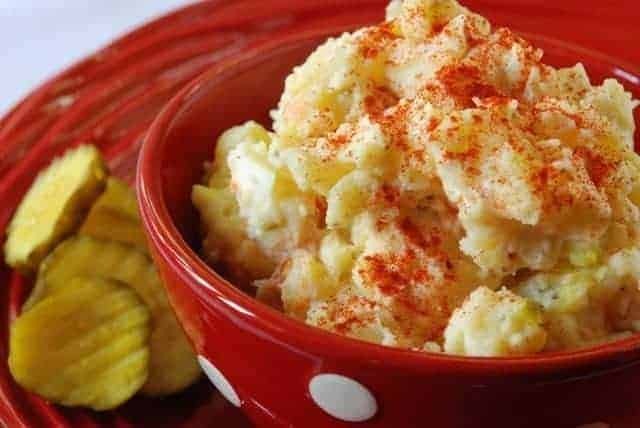 You can never have too many great potato salad recipes. This looks really good! great pic of the potato salad….looks yummy! Did you get a new blender? What happened to your red one? I may take up cooking! That looks really good. I wonder if we have a blender somewhere? You photo of the potatoe salad is fantastic! Love the red dishes. Just to give Mom her due – the original recipe came from our mom, not my mother-in-law, and you have altered it a little. Can’t wait to try your way.